Dr. Morris is Clinical Service Line Director, Isaac Ray Treatment Center, Logansport State Hospital, Logansport, IN, and Volunteer Clinical Assistant Professor of Psychiatry, Indiana University School of Medicine, Indianapolis, IN. Dr. DeYoung is a Neuropsychology Fellow, Department of Psychological Sciences, Purdue University, West Lafayette, IN. While the United States Supreme Court's Jackson v. Indiana decision and most state statutes mandate determinations of incompetent defendants' restoration probabilities, courts and forensic clinicians continue to lack empirical evidence to guide these determinations and do not yet have a consensus regarding whether and under what circumstances incompetent defendants are restorable. The evidence base concerning the restoration likelihood of those defendants who fail initial restoration efforts is even further diminished and has largely gone unstudied. In this study, we examined the disposition of a cohort of defendants who underwent long-term competence restoration efforts (greater than six months) and identified factors related to whether these defendants were able to attain restoration and adjudicative success. Approximately two-thirds (n = 52) of the 81 individuals undergoing extended restoration efforts were eventually deemed restored to competence. Lengths of hospitalization until successful restoration are presented with implications for the reasonable length of time that restoration efforts should persist. Older individuals were less likely to be restored and successfully adjudicated, and individuals with more severe charges and greater factual legal understanding were more likely to be restored and adjudicated. The significance of these findings for courts and forensic clinicians is discussed. Before the United States Supreme Court's 1972 Jackson v. Indiana decision,1 defendants adjudicated incompetent to stand trial (IST) often underwent indefinite hospitalizations under their IST status.2,–,4 However, the Jackson Court ruled that such indefinite hospitalizations violate defendants' constitutional equal protection and due process rights and held that an individual “committed solely on account of his incapacity to proceed to trial cannot be held more than the reasonable period of time to determine whether there is a substantial probability that he will attain that capacity in the foreseeable future.” If restoration of capacity is improbable, then “the State must either institute the customary civil commitment proceeding that would be required to commit indefinitely any other citizen, or release the defendant” (Jackson, p. 738). In response to the Jackson decision, nearly all states modified their competence restoration statutes. However, commentators in the decades since Jackson have noted many states' continued resistance to the spirit of this decision. Roesch and Golding4 reported that, by 1979, all but four states had revised their competency statutes. However, many of these revisions were not consistent with Jackson's mandates. Nineteen states continued to allow the automatic and indefinite commitment of IST defendants, and incompetent defendants could be held indefinitely in 24 states. Twenty years after Jackson, Morris and Meloy5 again reviewed state competency statutes and found that 33 jurisdictions did not statutorily answer whether courts were obligated to monitor defendants' progress toward competence restoration. They established that only 22 states had responded in good faith to Jackson's dictates and 28 states had either circumvented or ignored Jackson's requirements. Thirty years after Jackson, Miller6 surveyed state forensic mental health program directors and reported that directors in 21 states acknowledged that there continued to be no effective time limits on hospitalization for competence restoration in their states. Like many other states, Indiana struggles to implement Jackson's mandates effectively and to deal with defendants in whom initial restoration efforts fail. Indiana defendants adjudicated incompetent to stand trial are remanded to the custody of Indiana's Division of Mental Health and Addiction (DMHA) for competence restoration.11 Indiana statute allows outpatient competence restoration, but these services do not currently exist, and all defendants adjudicated IST undergo restoration efforts at Indiana state mental hospitals, typically Indiana's high-security Isaac Ray Treatment Center (IRTC). The Indiana statute12 allows a 90-day hospitalization for restoration efforts, which may be extended for an additional 90 days without formal court proceedings. Following these six months of restoration efforts, individuals not having achieved competence are referred for judicial determination of whether further hospitalization is warranted under Indiana's relatively broad civil commitment standards for dangerousness to self or others or grave disability. When civil commitment is granted, individuals continue competence restoration efforts in addition to typical state hospital treatment focused on reducing symptoms of mental illness and promoting improved functioning. Individuals admitted to IRTC and not restored, but demonstrating limited safety and security risks, may eventually be transferred to less restrictive state hospital settings, but it has remained DMHA policy to request renewals of unrestored defendants' commitments until their charges are dropped or the defendant has attained competence to stand trial. Those who seek guidance regarding the probability of restoration will quickly note the dearth of research and direction concerning restoration potential and authors urging caution in attempting to predict restoration success.15,–,17 Although recent empirical studies18,–,20 and clinician opinions21 have increasingly identified older individuals with chronic, treatment-refractory severe mental illness or mental retardation as less restorable and individuals with criminal histories and personality and nonpsychotic disorders as more likely to be restored, these general trends have limited utility for forming opinions regarding a given individual's restoration potential. Attempting to predict restoration success remains problematic, and the restoration likelihood of those individuals not restored during initial efforts has gone largely unstudied. In summary, the Jackson decision and most state statutes mandate determinations of restoration potential, but courts and clinicians have little legal or empirical guidance to satisfy these mandates. When individuals are not successfully restored during initial restoration efforts, the stakes become higher (i.e., potential de facto indefinite institutionalization), and the research base for making determinations regarding these individuals becomes virtually nonexistent. This study begins to answer calls for the analysis of long-term restoration potential so that forensic clinicians, courts, and policy-makers may have empirical information to aid their opinions regarding long-term restoration success and reasonable lengths of time for restoration efforts. This study received approval and monitoring from the Indiana University Institutional Review Board. The subjects formed a subset of an original group of the 460 male defendants admitted to Logansport State Hospital's Isaac Ray Treatment Center for restoration of competence to stand trial from 2001 to 2009. Factors associated with the original group's successful or failed restoration have been reported,22 and 370 (81.3%) of the 455 individuals who met study inclusion were restored to competence during six months of restoration efforts. The 81 individuals unrestored after six months of attempted RTC were civilly committed and continued their hospitalizations. Hospitalized under civil commitments, but remaining IST, these individuals continued restoration efforts. As reported in the original study, a database of subjects' clinical, legal, and demographic data was created.22 Clinical diagnoses were categorized as psychotic disorder (schizophrenia, schizoaffective disorder, delusional disorder, and psychotic disorder not otherwise specified (NOS)), mood disorder (major depressive disorder, bipolar I or II disorder, and mood disorders NOS), substance use disorder (substance abuse or dependence), personality disorder, and mental retardation (MR). Individuals with multiple diagnoses were identified as having disorders in all applicable categories. Demographic data including race, age at admission, presence of previous state hospitalization, and severity of referral charges were documented. In the current study, severity of referral charges was recorded as a continuous variable of 1 to 6, based on the increasing gravity of a defendant's most severe referral charge (e.g., misdemeanor, 1; murder, 6). Psycholegal abilities, assessed according to the McGarry criteria,3,23,24 for each individual during formal competency assessments at three and six months were also documented. Hospital records of the current study's cohort, those individuals remaining unrestored after six months, were reviewed, and their hospital courses and dispositions were retrospectively followed through December 31, 2012. Through review of hospital records and publicly available court proceedings, the ultimate results of these individuals' hospitalizations and the dispositions of their legal charges were recorded. The two primary outcome measures in this study were restoration and adjudicative success. Restoration success was based on hospital psychiatrist or psychologist judgment after a formal competency evaluation that an individual had attained the ability to proceed with his charge(s) and the hospital's certification of such to the referring court. Adjudicative success was indicated if a restored subject was able to complete his proceedings through either trial or plea agreement. Individuals whose charges were merely dismissed or who were again found incompetent to proceed were not considered to have had successful adjudication. Length of hospitalization to either opinion of restoration success or dismissal of charges was calculated. For both successful restoration and restoration with adjudicative success, length of time to these dispositions was based on the date of hospital evaluator certification that a defendant had attained the capacity to proceed. This study's initial analyses focused on proportions of the subjects attaining restoration and adjudicative success. The first set of analyses determined the cumulative percentages of the subjects restored to competency within set times. Percentages of restored subjects who were successfully adjudicated were also determined. The second set of analyses focused on the probability of future successful restoration and adjudication after set periods of hospitalization. With all these analyses, we followed an intent-to-treat (ITT) approach. Individuals whose charges were dropped or who died before restoration were defined as restoration failures. Restored individuals whose charges were dropped or who were again deemed incompetent for their charges before successful adjudication were considered adjudication failures. We used multivariate logistic regression analyses to assess the ability of diagnostic and demographic factors to predict both long-term successful restoration and adjudication. A backward stepwise approach was used to evaluate demographic and diagnostic variables and create prediction equations for successful RTC and adjudication. In our prior study, principal component analysis of the subjects' McGarry psycholegal abilities at three months of restoration efforts formed two factors involving six factual understanding items (possible penalties, appreciate charges, likely outcomes, court procedures, court participants, and appraise defenses) and six rational assistance items (plan strategy, testify relevantly, challenge witnesses, disclose pertinent information, relate to attorney, and manage behavior).22 Sums of these abilities previously possessed by our current cohort of subjects at three and six months were subjected to logistic regression to determine how the abilities contribute to long-term restoration probability. In these analyses, diagnostic and demographic factors previously identified as significant were controlled by forcing them into the regression as covariate variables. These analyses were repeated for probabilities of successful adjudication. Demographic information for the 81 subjects revealed that 51.9 percent of the subjects were white, 45.7 percent black, and 1.5 percent Hispanic. Mean admission age was 37.1 years (SD 12.4) and ranged from 18 to 63 years. The presence of a psychotic disorder was high, with 82.7 percent of the individuals having such a disorder. A mood disorder diagnosis was held by 13.6 percent of the subjects, and 38.3 percent had a substance use disorder. Mental retardation and personality disorders were identified in 19.8 and 14.8 percent of the individuals, respectively. Approximately half of the subjects (49.2%) held diagnoses in two or more diagnostic categories. Thirty-five subjects (43.2%) held a single study diagnosis, and six (7.4%) did not have a diagnosis defined in the study. Mood disorders were more prevalent (25.0% versus 4.4%; p < .01) among subjects with greater charge severity (charge levels, 4–6) than lesser charge severity (charge levels, 1–3). Otherwise, the prevalence of psychiatric diagnoses, comorbidity, and average number of diagnoses per individual did not differ between the groups of individuals having more serious and less serious charges. The index restoration hospitalization was the first state hospitalization for 79.0 percent of the subjects. The other 21.0 percent had undergone one or more previous state hospitalizations. Seventy-five subjects (92.6%) had pending felony charges. The remainder had misdemeanor charges. The distribution of the subjects' most serious referral charge was murder (n = 5); Class A (n = 20), B (n = 11), C (n = 14), or D (n = 25) felonies; and misdemeanor only (n = 6). Subjects eventually restored to competence had more serious referral charges, on average (3.62, SD = 1.44), than those who were not restored (2.90; SD 1.45) (t(79) = −2.15; p = .035). Among the other demographic and diagnostic factors, only age at admission differed significantly (t(79) = 3.46; p = .001) between the subjects restored to competence (33.7 years; SD 10.5) and those who were not restored (43.0 years; SD 13.3). Figure 1 shows the ultimate dispositions of individuals continuing restoration efforts after six months. Fifty-two of these individuals were eventually deemed restored to competence and returned to the criminal courts. Twenty individuals' charges were dropped during their hospitalizations. Two individuals died while hospitalized, and seven remained hospitalized, both under civil commitment and remaining IST. Of the 52 individuals continuing their legal proceedings, 44 proceeded to adjudication. Six individuals' charges were dropped before formal adjudication, and two were again deemed IST and rehospitalized for restoration efforts. The average hospital length of stay (LOS) until restoration of competence was 1.58 years (SD 0.98), and the average LOS to restoration for subjects who eventually reached adjudication was 1.42 years (SD 0.67). Disposition of subjects who were not restored after six months of restoration efforts. *Subjects whose charges were dismissed during their hospitalizations continued their hospitalizations under their civil commitments and were eligible to progress through less-restrictive settings to eventual community discharge. Figure 2 depicts the cohort's cumulative restoration and eventual adjudicative success during subsequent years of restoration efforts. Between two and three years of restoration efforts, the rate of restoration and adjudication plateaued. After 3.5 years of restoration efforts, further successful restoration was rare, and there was no further successful adjudication. Table 1 numerically depicts this information and cumulative percentages of individuals restored and eventually successfully adjudicated within set years of restoration efforts. Again, the majority of successful restorations occurred during the initial years of restoration efforts, with 75 percent of those subjects restored attaining restoration within the first two years of efforts. Similarly, nearly 80 percent of those individuals restored who were successfully adjudicated were restored during the initial two years of restoration efforts. Within three years of restoration efforts, 59.3 percent of all subjects were successfully restored, and 53.1 percent were restored and successfully adjudicated. Cumulative restoration success over time for incompetent defendants who were not restored during six months of restoration efforts. During the study period (through December 31, 2012), all but two subjects were either hospitalized for longer than 5.5 years or reached final disposition of their legal charges. The two subjects remaining IST and hospitalized for less than 5.5 years were hospitalized for 3.77 and 4.10 years at study's end. These subjects may increase the total number of subjects eventually restored and successfully adjudicated. Table 2 indicates percentages of the subjects eventually attaining restoration and adjudication following set periods of hospitalization. Once again, potential for successful restoration decreased with extended restoration efforts. Although 13 subjects (31.0%) hospitalized longer than two years were eventually restored, the likelihood lessened to 12.1 percent after three years of hospitalization. The likelihood of proceeding through successful adjudication was even lower, with less than 10 percent of those hospitalized longer than 2.5 years eventually undergoing successful adjudication. Multivariate logistic regression was used to assess the effect of diagnostic and demographic variables on restoration. A backward stepwise approach was used to evaluate these variables to create a prediction equation for restoration probability. The removal criterion was set at p > .10, and the re-entry criterion was set at p < .05. This approach produced a two-variable equation (Equation 1) predicting the probability of restoration success. Predictions of the likelihood of successful restoration showed that subjects who were older at admission were less likely to achieve competence (odds ratio (OR) = 0.94). Every additional year of age at admission reduced the likelihood of successful RTC by a factor of 0.94. Defendants charged with more serious offenses had higher likelihoods of successful RTC (OR = 1.41). For each increase in the severity of the charge variable (a factor of 1 to 6), participants were 1.41 times more likely to achieve competence. The logistic regression was again performed that included subjects' cumulative 3- and 6-month factual understanding and rational assistance McGarry abilities. However, these variables did not reach significance and did not alter the results of Equation 1. This logistic regression procedure was also used to predict the likelihood of participants' achieving RTC with eventual successful adjudication of their charges. The regression model again evaluated demographic and diagnostic variables. The result was a single variable equation (Equation 2) that included only age at admission. Similar to Equation 1, Equation 2 showed that older subjects were less likely to reach adjudication of their charges (OR = 0.92). Charge severity was no longer retained as a factor influencing adjudication probability. When previous psycholegal abilities were included in the analysis, a three-variable solution (Equation 3) emerged that included admission age, charge severity, and extent of factual legal understanding at three months of restoration efforts. Consistent with the other equations, older admission age decreased the likelihood of adjudication (OR = 0.92), whereas increased charge severity increased adjudication likelihood (OR = 1.41). Equation 3 is the only equation in which the subjects' previously assessed psycholegal abilities contributed significantly to the prediction equation. Higher levels of factual understanding at the 3-month evaluation increased the likelihood that a subject's charges would be adjudicated (OR = 1.37). For every increased McGarry factual understanding ability at three months (a factor of 1 to 6), subjects were 1.37 times more likely to reach adjudication of their charges. To our knowledge, this is the first published study describing long-term competence restoration outcomes and represents a starting point for empirical studies of long-term restoration likelihood and those factors associated with its success or failure. While studies of initial restoration trials have indicated that 75 to 90 percent of individuals are restored in approximately six months of inpatient restoration,13,14 the dispositions of those individuals unrestored remain problematic for courts and forensic facilities. 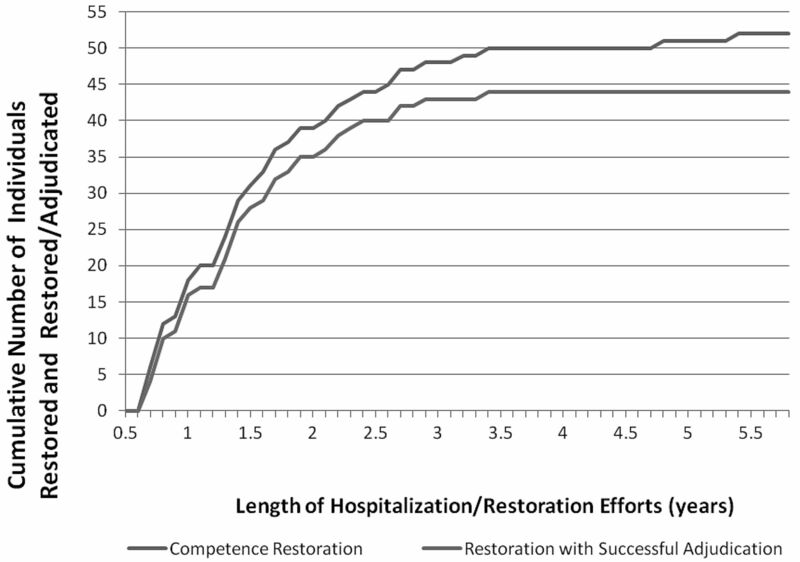 Within this cohort of 81 individuals continuing restoration efforts after six months, we found that the majority (64.2%) were eventually deemed restored to competence. This finding argues for extended restoration efforts, but in light of Jackson's mandates, what is a reasonable period of time for such efforts? The challenges that make predicting successful restoration difficult become even greater when attempting to predict restoration after initial attempts have failed, and few factors emerged from this study to aid clinicians in predicting successful restoration. Certainly, an added problem is the relatively low base rate of individuals in whom initial efforts fail, which leaves smaller subject pools to study. The primary usefulness of the current study, however, lies in forming a starting point for providing empirical data to courts regarding restoration potential during extended efforts. For example, a court questioning the further usefulness of restoration efforts after two years of such efforts could be informed that approximately 20 percent of defendants in this circumstance eventually complete successful adjudication of their charges. Following another year of such efforts, this likelihood drops to below three percent. Although few diagnostic and demographic factors were indicative of long-term restoration outcomes, older individuals were less likely to be restored to competency, and increasing age at admission decreased the probability of successful restoration. This finding is consistent with previous restoration studies linking older age at admission with decreased likelihood of restoration.19,20,25 Although crystallized abilities (information and skills gained from experience) and verbal abilities typically remain stable with normal aging; fluid intelligence (flexible reasoning and problem solving), nonverbal intelligence, and information-processing speed decline with age.26,27 Impairments in these fluid abilities may be increasingly detrimental to defendants' abilities to follow developments in their proceedings and to be of functional assistance to their attorneys. An increasing severity of referral charges also enhances the probability of successful restoration. At least one prior study has suggested that individuals with previous criminal histories and current violent offenses are more often predicted to be restorable.28 Forensic hospital clinicians and administrators have also reported that the severity of index offenses can impact decisions regarding how soon an individual is determined to be unrestorable.21 Despite presumptions that the standard for competency should rise with the increasing stakes and complexity that are often present with greater charge severity, we found that individuals with more serious charges were more apt to be restored. Several explanations could account for this finding. Subject bias regarding psychiatric morbidity appears to be limited, as psychiatric diagnoses were not significant factors in our regression models, and psychiatric morbidity did not differ between individuals with more or less severe charges. However, a dispositional bias related to the seriousness of subjects' charges may contribute to this finding. Although Indiana statutes do not base the length of allowable restoration efforts on the severity of a defendant's charges, it remains more likely that prosecutors will dismiss less serious charges as the lengths of defendants' confinements reach or exceed the maximum potential criminal sentence. Our ITT classification of individuals with dismissed charges as unrestored made it more likely that defendants with lesser charges would consequently be characterized as unrestored, increasing the probability of apparent restoration failure in those with lesser charges. Another explanation for the increase in the association of charge severity with greater restoration probability may lie in evaluator biases. Political pressure to prosecute violent offenders has been postulated to contribute to the prediction that defendants with serious charges are more often restorable.28 Pressure to free hospital beds and reduce RTC waiting lists may also provide motivation to return IST defendants to the legal system.21 These considerations are likely multiplied in states that do not set effective time limits for restoration efforts. Potential slippage in competence standards may further increase when evaluators are confronted with choosing whether marginally competent defendants will either proceed with their charges or continue protracted hospitalizations. 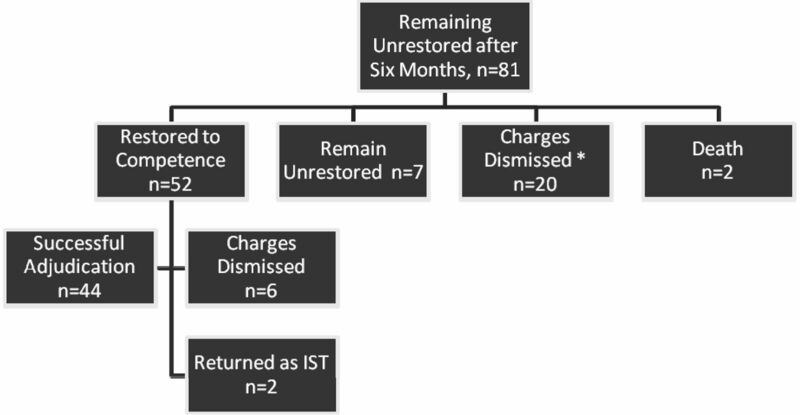 Although the association of greater charge severity with increasing restoration potential is an interesting finding warranting further study, it remains noteworthy that restoration efforts do not occur in a vacuum devoid of political and institutional pressures, and these considerations further highlight a difficulty in studying the inherent, long-term restoration potential of individuals with charges of varying severity. Finally, a defendant's degree of factual legal understanding at three months of restoration efforts was predictive of eventual restoration with successful adjudication. Although we have previously demonstrated that defendants' rational assistance abilities carry greater weight in determinations of successful restoration at the time these abilities are assessed, factual legal understanding at three months, rather than rational assistance abilities, emerged as the group of psycholegal abilities influencing RTC probability at six months.22 We hypothesized that individuals with greater bases of legal understanding were better equipped to attain the rational assistance abilities necessary for ultimate RTC success several months later. The current study's similar finding that factual understanding was predictive of ultimate adjudicative success further supports the importance of possessing this basic understanding early in restoration efforts. Unfortunately, information regarding subjects' psycholegal abilities, both at the time of their original findings of incompetence and at their hospital admissions was not available for analysis. Future studies evaluating the influence of defendants' psycholegal abilities at these times on future success of restoration and adjudication would most likely prove meaningful. Individuals who died or whose charges were dismissed were not defined as successfully restored. We further defined successful adjudication as whether an individual who was restored was able to proceed through the legal system to successful resolution of his charges through either trial verdict or plea arrangement. We chose these approaches for both methodological and theoretical reasons. During long-term restoration efforts, an individual's charges may be dismissed either before or after hospital certification of RTC. For such situations, we followed an ITT approach and considered efforts at restoration, adjudication, or both for such individuals to have failed. This approach is analogous to classifying withdrawal from a pharmaceutical study as failure of the study intervention. While it is not certain whether these individuals would eventually attain restoration or adjudication, simply removing them from consideration could falsely elevate rates of apparent restoration and adjudication success. Individuals who were restored but had their charges subsequently dismissed were defined as successfully restored, but unsuccessfully adjudicated. Dismissal of charges in this circumstance does not allow an adequate test of whether an individual would be able to navigate the legal system to formal adjudication of his charges. Such dismissals also present questions regarding the purpose of extended restoration efforts if the court ultimately believed that dismissal was the appropriate disposition. The U.S. Supreme Court's Sell v. United States decision,33 outlining the conditions necessary for involuntary psychotropic medications to restore competency, also has the potential to affect results of restoration studies, with treatment refusals potentially confounding reports of restoration outcomes. However, the Sell decision has had little impact on competence restoration in Indiana. Indiana courts and state hospitals continue to follow the paradigm that court-ordered restoration includes psychotropic medications to promote these efforts, and the onus has been placed on IST defendants to prove that involuntary medications are inappropriate. Although there are arguments for and against Indiana's referral and treatment practices, these practices have strengthened the current study. Sample bias was limited by the hospitalization of all IST defendants, and individuals with little restoration potential were not selected out of our subject population before hospitalization. Allowable restoration time limits also did not differ on the basis of severity of referral charges and did not allow charge severity to influence how quickly hospital evaluators were required to form competency determinations. Treatment bias was further limited, with it being difficult for IST defendants to refuse the suggested treatment. We believe that these practices have allowed the study of a full range of IST defendants with various charges and restoration potentials who predominantly received the suggested treatment for their psychiatric illnesses. In addition to the limitations previously identified, this study's limitations include those common in retrospective studies, primarily the inability to verify diagnoses and competency opinions independently. The relatively small number of subjects failing initial restoration efforts also limited the available pool of such subjects for study. This difficulty is compounded when external factors such as dismissal of charges suddenly end restoration efforts and make it impossible to determine ultimate restoration outcomes had efforts continued. While the McGarry criteria help to structure CST evaluations, both individual McGarry criteria determinations and ultimate restoration opinions rested largely in evaluators' subjective ratings of defendants' abilities. Future studies using instruments with more objective and measurable scoring of psycholegal abilities, such as the MacArthur Competence Assessment Tool–Criminal Adjudication (MacCAT-CA)34,35 and the Evaluation of Competency to Stand Trial–Revised (ECST-R),36 would be helpful in quantifying individuals' competency-related abilities during restoration efforts. Despite these limitations, we believe that we have been successful in observing and describing a cohort of individuals undergoing extended restoration efforts. With this study, we sought to address the lack of empirical evidence concerning the reasonable length of time necessary for adequate restoration efforts and the lack of consensus regarding whether and under what circumstances an individual is likely to be restored. Through this study, we have presented the disposition of a cohort of defendants who underwent long-term restoration efforts. These findings represent one of the first attempts to provide empirical information to courts regarding the likelihood of long-term restoration and form the first steps in improving forensic clinicians' abilities to provide expert testimony concerning reasonable lengths of time for restoration efforts. We encourage other investigators to pursue similar studies to define further and solidify evidence-based understanding of long-term restoration potential. The authors acknowledge the following individuals for their assistance: Lois (Jo) Curtis-Bamberga and Michelle Britt for their help in retrieving patient records; Brian Newell, MLS, for aid in obtaining relevant literature; and George Parker, MD, for helpful comments and suggestions for the manuscript and assistance in facilitating this research project with the Indiana DMHA. The authors also acknowledge Logansport State Hospital and the Indiana DMHA for their support and efforts to improve forensic knowledge and quality of patient services. Jackson v. Indiana, 406 United States 715 (1972). Ind. Code § 35-36-3-1 (2010 Supp.). Ind. Code § 35-36-3-4 (2008). Ind. Code § 35-36-3-2 (2008). Curtis v. State, 948 N.E.2d 1143 (Ind. 2011). State v. Davis, 898 N.E.2d 281 (Ind. 2008).